On Tuesday, the team had the chance to go downtown and speak with several health inspectors with the City of Houston’s Department of Health and Human Services – Bureau of Consumer Health Safety. Carolyn Gray, the Chief Sanitarian, organized an excellent field trip for them. It started with a powerpoint presentation about food safety and the possible points of food contamination. Larry Goodman, one of the food inspectors, gave a demonstration on how to properly sterilize dishes and utensils and the importance of doing so, especially in the retail restaurant setting. He also talked about the most common food safety violations inspectors come across. CP Yang, talked to the team about the equipment inspectors use during their inspections. They were also extremely generous and gave the team their own refrigerator thermometers to take home, a food testing thermometer, dish sanitation temperature devices, as well as chlorine test strips. After the presentation at the Department of Health and Human Services, the team ate lunch in the Memorial Hermann Hospital Cafe before their 1:00pm meeting. CP Yang arranged to have the team go on a simulated inspection of the hospital’s kitchens. After lunch, the team was met by Bob Peake, the Director of Retail Operations for Memorial Hermann Hospital. He took the time to teach them even more about food safety. And on top of a great educational experience, Bob treated the kids to pizza, cookies, and fruit. 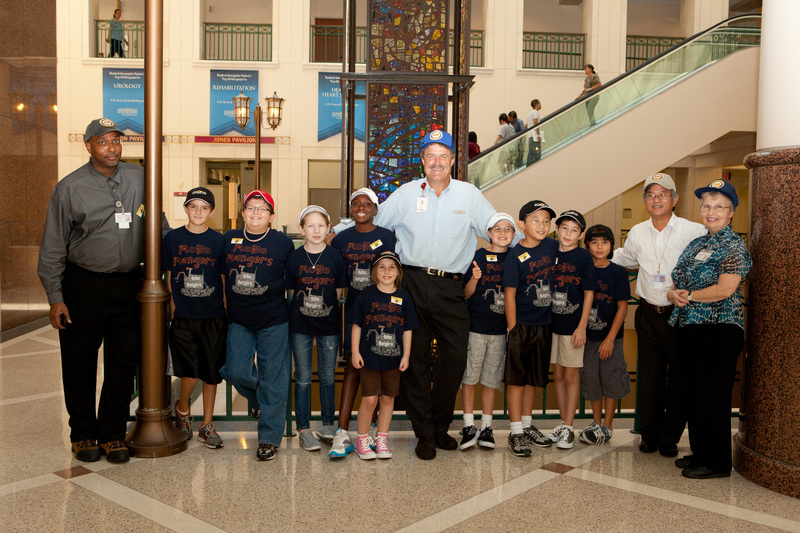 The kids were also given a Memorial Hermann hat to wear during the inspection and to keep afterwards. Bob also arranged for Sharon Cox, the Director of Nutritional Services, and the head chef of the hospital to come and meet the team. Next, Angie Garrett, the Director of Health Care Improvement, did a hand washing demonstration with the kids. Simulated bacteria were sprinkled on their papers and they were taught the proper way to wash their hands. The boys were loudly singing “Happy Birthday” while washing their hands. After the team all washed their hands, their hands were inspected under a blacklight to see just how clean they got their hands. Not so good! Some team members had germs all over their faces, shirts, and still on their hands. Alex won a prize for getting his hands the cleanest. Angie Garrett also gave the team a bag of goodies to take home with them. Next it was time for the hospital inspection. The kids got to see the cooks in action while observing the ways that the staff keep foods safe while they preparing to feed over 4500 people per day. The team got to go into the -10 degree freezer and they loved going in the Coke cooler. On their tour of the kitchen areas, they were treated to Blue Bell Chocolate Ice Cream. Yum! The Roborangers would like to extend a huge thank you to Carolyn Gray, CP Yang, Larry Goodmand, Bob Peake, and the staff at Memorial Hermann Hospital for providing the team with a wealth of knowledge that they can apply towards their FLL Food Factor research project. Here is a slideshow of highlights from our day. Enjoy! This entry was posted in Field trips, FIRST Lego League, Food Factor, Food Safety, Houston, Photos, Team meetings, Videos and tagged field trip, FIRST Lego League, FLL, Food Factor, food inspection, food safety, Houston, Houston FLL, Roborangers. Bookmark the permalink.